Where the Taohua River and Lijiang River meet, on the western bank of the river Li, in Guilin, China you’ll find one of the world’s most magical places. Among the lush forests and undulating hills in Elephant Trunk Hill Park is a hill which has captured the imagination of man for thousands of years – Elephant Hill. Elephant Hill rises 55 meters above the Li River then gently arches over the river like an elephant leaning into the water to drink. 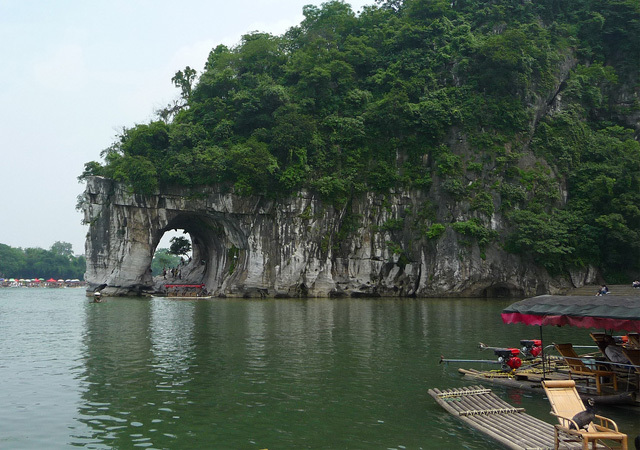 At the foot of the limestone karst hill, where the rock meets the water, the elephant’s “trunk” can be seen entering the water as an arch is formed. The huge elephant leans over and Water Moon Cave is created between the “trunk” and the shore or “legs” of the creature. 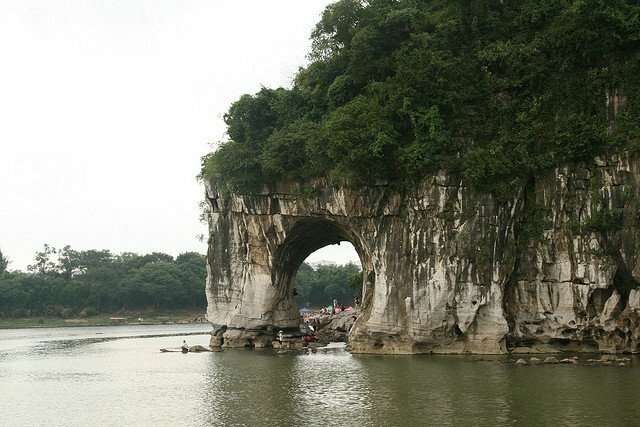 The semi-circular Water Moon Cave has been penetrated with water over the course of centuries and the calm water flows beneath the arch forming a romantic passageway. The cave is 17 meters long, 9.5 meters wide and 12 meters high. On still China nights a mesmerizing phenomenon occurs whereby the moon appears to be both under the water and floating on the surface as it is reflected beneath the elephant’s trunk in Water Moon Cave (Shuiyue Dong). Visitors to Elephant Hill can take moonlit boat rides through Water Moon Cave and try to capture the magical moment. This beautiful sight has been described by Chinese poets and visitors to the site over the years. Within the cave over 70 inscriptions from the Tang and Song Dynasties have been found describing the beauty of the site. In the past Elephant Hill has been called Li Hill, Yi Hill and Chenshui Hill. The site dates back 3.6 million years, it is 108 meters long, 100 meters wide and 200 meters above sea level. Elephant Hill has become the symbol of Guilin and in the nearby city the elephant features prominently on signs, logos and art work. During the day Elephant Hill is just as charming; visitors can follow stone steps to the top of the hill and get breathtaking views across the water flowing below the tree covered hill. The two story Puxian Pagoda is perched on the hill top, on the Elephant’s back. The pagoda dates back to 1368-1644 (Ming Dynasty) and from a distance resembles the handle of a sword rising 14 meters from the elephant’s back. There are two caves on the hill side which have been called the elephant’s “eyes” and from these caves visitors enjoy panoramic views of Guilin. In the vicinity visitors can also see the Yunfeng Monastery, Rooster Fighting Hill (Doujishan Hill), Pagoda Hill with its seven story brick tower and Aiqing Dao or Love Island. To reach Love Island visitors cross a stone bridge with elephant carvings and once there the island has marked trails and symbols of love among the rich vegetation. Previous ArticleThe Most Spectacular Marble Caves in the World!